American Idol Jessica Sierra Celebrates Childbirth, Sobriety, and Singing Once known as the “fallen American Idol,” 24-year-old Jessica Sierra is a young woman triumphant these days. With two years of sobriety under her belt, she recently celebrated the birth of her new baby boy, Kayden Cash, on December 5, 2009. Now Jessica is back in the studio doing what she does best, singing! Under new management with Elite B Management, and working with producer Sebastian Evans II, her new CD will showcase her covering ballads, rock and R&B as only she can! 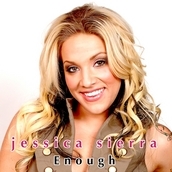 Her single release, “Enough,” slated to drop soon, displays her trademark powerhouse vocals and rocks with the heart-felt emotion of one who has risen new heights after experiencing the depths of despair. As an “American Idol,” Jessica performed all over the world. A Top Ten finalist, she toured nationally with fellow contestants, including appearances at the Coca-Cola 600, an extensive Simon Mall concert tour, and the 44 city, sold out American Idol arena tour. The American Idol Showstoppers album featured her single “Total Eclipse of the Heart” and was certified Gold by the RIAA. When America last saw Sierra, it was 2008. She had completed an entire season of VH-1′s “Celebrity Rehab with Dr. Drew” seemingly to no avail. The former Season 4 contestant shocked and disappointed her fans around the world when she pleaded “no contest” to assault and cocaine possession charges in a courtroom in her native city of Tampa, FL, just months prior to the show’s airing. Happily those dark days are now long gone. Today, when not in the studio, Jessica is busy keeping youth from the path she traveled, motivating kids via her work with the Santa Anita Family Services Center in Monrovia, CA. “As a former American Idol I realize that I was a role model to millions of kids who aspire to achieve the success I attained. I was anything but a role model for a long time, but hope that my life lessons will deter someone else from the path of fast living and drug abuse. My voice is a gift and I am overjoyed to be given the opportunity to share it again. Music has always been a grounding and healing force in my life,” reveals Jessica. “I hope that it once again inspires others.” Jessica Sierra is a true “American Idol.” She embodies the spirit of a courageous warrior. She has soared the heights of success and pummeled to the lowest degrees of despair, only to rise again. With her new found sobriety and new baby, Jessica Sierra has a new song in her heart and America can sing along with her once again!